WASHINGTON (Reuters) - The Bush administration said on Friday it tentatively planned to let Pakistan buy 115 155mm self-propelled howitzer artillery pieces as well as related gear and services valued at up to $56 million. The sale of M109A5 howitzers would not affect the basic military balance in the region, the Pentagon's Defense Security Cooperation Agency said in a notice to Congress. The big guns at issue are in the U.S. Army's current inventory, said Jose Ibarra, an agency spokesman. The total value of the deal, if all options are exercised, could be as high as $56 million, the notice to Congress said. Such notice is required by law. Congress has the power to block such a government-to-government arms sale but has never done so. No contractor would be involved in the deal. Pakistan currently operates an earlier-generation self-propelled howitzer, the M109A2. It would use the newer model to re-equip existing units and retire older artillery pieces, the Pentagon said. The sale would help Pakistan enhance "internal command and control of the mountain range bordering its country," the notice said. It said a U.S. technical assistance team and a U.S. government quality assurance team would spend a year to check out the howitzers. In addition, a U.S. technical assistance team would take part in "program management and technical reviews" twice annually for two weeks at a time, the Pentagon said. That's a lot of heavy artillery. How do you broke down the figures for distribution among the 19 platoons, 9 batteries, 3 battalions, about 1 brigade , i mean what formula you adopted and more over isn't 155mm gun considered as a medium artillary gun. So anyone want to guess or give his idea where he should have placed these new guns and why? What about making them a part of 1 Corps or 2 Corps as these are strike corps or adding them up with some mechanized infantry brigade so can make it real mechanized. But the concept of firing a salvo and changing the position to avoid counter battery fire as fire finder radars are becoming more and more common now a days. OK, its good that we are getting US M 109A5s but what about PLZ 45 or PLZ 05 from China. Probably PLZ 45 has already been exported to Kuwait and after dilevery of first batch further orders were placed. Major benefit of these guns will include easy spare availability, no inspections, no visible sanctions threat. More over these will be probably cheaper and could be acquired in larger numbers. isn't 155mm gun considered as a medium artillary gun. 155-mm howitzers are standart heavy artillery for NATO and many other countries. Chinese and Russians use 152-mm caliber.They also have 203-mm howitzers,but they are pretty rare,because of their transportation problems,due to it's size and weight. Fantastic news especially in light of our little shortage of heavy artillery the M109A5 are best you can get with excellent ground mobility and the user to make custom modifications to meet mission objectives. Any idea how much the upgrade to "Paladin" status costs if we wanted to in the future? we got arnd 40 of those aswell. If anyone has paid attention in a few threads I've been saying India has an edge over us in artillery! But now with these 115 M-109A5s, the game is now pretty even! All Pakistan needs is some more MRLs. Lighter ones, because the Type-83 has like 320mm tubes. Pakistan should get 122mm MRL. Maybe the Kooryong. is M109A5 howitzers better than sweadish bofors?? How do you broke down the figures for distribution among the 19 platoons, 9 batteries, 3 battalions, about 1 brigade , i mean what formula you adopted and . arent we getting chinese plz45 why M109A5 ??? whats the per unit cost of both ??? Chinese and Russians use 152-mm caliber. They also have 203-mm howitzers,but they are pretty rare,because of their transportation problems,due to it's size and weight. Doesn't Pakistan still use the old US M110 203mm (8 inch) howitzer? My National Guard unit just gave thiers up in 2003! and why US ally kuwait opt for chinese Howitzers when american was there ??? The M109A5 is a modified M109A4 it consists of two major improvements: a new M284 cannon and a new M182 gun mount. These improvements provide the M109A5 with greater range and allow for sustained fire for prolonged periods of time. Over 950 existing M109s have been rebuilt as the M109A6 Paladin. The Paladin configuration is achieved through extensive modifications to existing M109A2/A3 vehicle hulls and the subsequent introduction of an entirely new turret structure. The remaining M109 howitzer fleet has received the M109A5 upgrade, which included some of the same automotive and crew NBC protection improvements as well as the Paladin's M284 cannon and M182 gun mount. 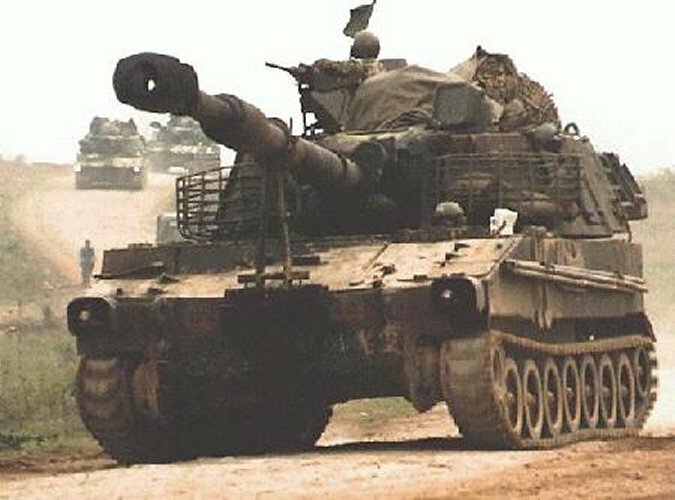 A requirements survey was forwarded to authorized security assistance customer countries on 10 February 2003 , advising of the availability of Long Supply M109A5 self-propelled (SP) 155mm howitzers at a reduced price. The howitzers are available for immediate sale to countries addressed in the survey. These countries were determined by Defense Security Cooperation Agency, Commerce and State Department review. Upon receiving acknowledgement of interest from a foreign customer addressed in the message, allocations will be made, as received, on a “case by case basis.” Allocations may be constrained by the number of available assets remaining and it is possible that all howitzers may be committed. The M109A5, 155mm SP medium howitzer is a vehicle that provides armored combat support, is air transportable, internally loaded, and has excellent ground mobility. The M109A5’s main armament is the 39-caliber, M284 cannon, which has a maximum range of 23,500 meters with unassisted projectiles and 30,000 meters with Rocket Assisted Projectiles (RAP Rounds). The cab of the M109A5 rotates in a full 360-degree circle, allowing operation of both its primary (the 155mm cannon assembly) and secondary (the M2 heavy barrel caliber 50 machine gun or MK19 40mm Grenade Launcher) armament in any direction. The system is capable of both direct (line of sight) and indirect (out of the line of sight) firing. The vehicles have a cruising range of 220 miles at speeds up to 35 miles per hour. The M109A5 howitzer gives the customer the maximum flexibility to tailor modifications to meet desired missions requirements. It can accommodate future technology and is economical to purchase, operate, and maintain. The M109 family of howitzers continues to be improved to generate additional operational capabilities and cost savings for the customer. It continues to be backed by the extensive life-cycle sustainment support of the weapon's proponent. The FMS price is $292,721 per howitzer, and excludes packaging, handling, crating and transportation costs. The howitzers are being offered in "as is-where-is" condition. Some of the vehicles may have visible signs of wear and corrosion and various shades of paint; but all of them are rendered serviceable, structurally sound, and are economically reparable. Further, the howitzers may be missing: Components of End Item (COEI); Basic Issue Items (BII); Auxiliary Equipment; and other Additional Authorized List (AAL) type items; be in excess of hour/mileage standards; and may not have applicable publications/records. Therefore, a Joint Visual Inspection (JVI), by country personnel, is strongly recommended to determine if the allocated Long Supply Howitzers meet customer’s specifications/standards. Most of the howitzers are stored inside at one location in the United States for the recommended JVI (at this location, the vehicles are currently stored in a humidity controlled environment). The M109A5 howitzers can be brought to a Fully Mission Capable (FMC) Standard prior to delivery for an additional cost. This option can be achieved at the current storage facility prior to shipment. This Program ensures that all of the howitzer's systems and subsystems are fully operational and standards are met in accordance to the Operational Preventative Maintenance Checks and Services (PMCS) of 10/20 Manuals. Oil samples will be taken and analyzed from the engines, transmissions, and hydraulic systems to ensure that these systems are in good shape and do not have any detectable problems. The traversing, elevation, fire control, rammer, personnel heater, gun mount, and cannon systems will be checked for proper operation and repaired as needed. All of the replenishers, recuperators, and fire control nitrogen charges will be checked and re-charged as needed. The fire extinguishers will be checked for proper load to ensure that they are fully charged and ready for operation. If the customer plans to use the vehicle with the VIC-1 intercom system, it will be checked to ensure proper operation. The outside of the vehicle will be repainted according to the customer's color requirements, and the inside of the crew compartment will be painted as needed. The fuel system will be flushed and any contaminants will be removed from it. New batteries will be installed in all of the vehicles, and all track pads with less than 50 percent of life remaining will be replaced. Finally, the vehicles will be driven two miles as a road test to ensure that they have no mobility problems and each vehicle will have a minimum of 50 gallons of fuel in their tanks for ease of loading and off-loading them during shipping. This proposed repair program is designed to ensure that the customer receives a good-looking, fully operational howitzer for as little cost as possible. If the customer desires additional upgrade component replacement (new 8V71T–91 Series Engines; overhauled/modified XTG-411-4 Transmissions; new T154 track, etc. ), their requirements can be easily added to the Scope of Work (SOW) for the repair program and the customer would have to pay for these additional requirements. Further, thirty percent of the M109A5 Howitzers have a restriction on either the Breech Block or Breech Ring; however, these items can be replaced at an additional cost. If the customer selects one of these vehicles during the JVI, the Rough Order of Magnitude (ROM) for these items will be provided at that time. The M109A5 155mm SP howitzer may also be upgraded to the more modern M109A6 SP howitzer (Paladin). The Paladin provides a revolutionary advance in performance, responsiveness and survivability. Able to operate independently, it has a firing range up to 30 km with the standard M284 39-caliber 155mm main armament. From the move, the M109A6 Paladin can receive a fire mission, compute firing data, select and take up firing positions, automatically unlock and point its cannon, fire the first round in under 60 seconds and move - day or night. This "shoot and scoot" capability not only significantly improves responsiveness to calls for fire, it also protects the vehicle and crew from counter battery fire - significantly improving survivability. Paladin features include an Automatic Fire Control System with onboard ballistic computation and automatic weapon pointing, an integrated inertial navigation system with embedded Global Positioning System (GPS) processing, Nuclear, Biological and Chemical (NBC) protection with climate control, hydraulics system segregation, and secure voice and digital communications. Hull , turret, suspension and automotive upgrades significantly increase reliability, providing 40 percent greater operational availability than previous versions of the M109. On board, embedded electronic diagnostics improve maintenance and repair functions. "Paladin was first fielded in 1994 and is operational with the United States Army and the Israeli Army, and has been selected by the Kuwait and Taiwan." what kinda Howitzers indians use and how we can compare M109A5 to them !!! Indians Use Bofors In A Quite Large manner i Think. I found an interesting website that compares the basics of the militaries of two countries. You enter the countries and out comes the numbers. Click here. The Indian Army is shortly expected to place an order for new 155mm/52-caliber howitzers as part of its Field Artillery Rationalization Plan. It is expected that a total of up to 4000 howitzers will be procured to equip its 185 tube artillery regiments. This procurement programme is expected to be spread over the next two decades, and filled through a combination of outright purchase and licensed manufacture. This requirement for 155mm/52-claiber guns has been motivated by four main considerations. thanks ISI for info what about plz45's per unit cost ? Kim, Pakistan already has a 122.5 mm MRLS system. What we really need is something like the A-100 and WS-1B (and I don't think that Pakistan has the Type 83 because I haven't read official confirmation of it). "Price Range. In equivalent 2000 United States dollars, the unit price of the Chinese 155/45 self-propelled howitzer is $2,212,000; this figure is for ten units." Actually ISI, you are wrong here. You see, the Kuwaiti Army bought the PLZ-45 because it had suerior performance when compared to its American counterparts. As a matter of fact, the PLZ-45 has a GPS sytem while the American one doesn't. "Paladin features include an Automatic Fire Control System with onboard ballistic computation and automatic weapon pointing, an integrated inertial navigation system with embedded Global Positioning System (GPS) processing, Nuclear, Biological and Chemical (NBC) protection with climate control, hydraulics system segregation, and secure voice and digital communications. Hull , turret, suspension and automotive upgrades significantly increase reliability, providing 40 percent greater operational availability than previous versions of the M109. On board, embedded electronic diagnostics improve maintenance and repair functions." Like I said before, the Kuwatis already have M109s. but the question remains the same why kuwait bought plz45 against american equipment although some here say later is superior. whats the reason behind it ????? Paladin is a modified M109. An enhanced version of the othe M109 platform. A5 is the standard improvement to the platform. Paladin is a more advanced system ot the M109A5. Either way this is very good news as Pakistan needs heavy calibre artilary. The indians out do Pakistan when it comes to heavy guns we could put these to good use. By the way does wah factory or Pakistan ordanance factory make 155mm shells. I was enquiring about how much the Paladin upgrade would be but no one has answered yet. The Paladin is the M109A6 which would have been in competition with the Chinese system. One of my colleagues told me about 3-4 months ago that Pakistani millitary personale were already getting training on these howitzers here in the U S.
It's pretty much an imporved electronics suite that separates the A5 from the A6. I'm a big fan of heavy artillery, and the electronics are nice, but not essential. Doesn't Pakistan already have the M109A2? Anyway, to answer, the A6 is better but the A5 will suit the Pak army very very well. As far as our upcoming M 109A5 are concerned I would have preffered to get them upgraded to A6 Paladin standards before shipment to Pakistan. These will significantly enhance its capabillities. More over the more protection we have against counter battery barrage, the better chances we stand to support our forces by means of sheer fire power. A battalion of howitzers were delivered to the Kuwait along with a full package of support, command and control, forward observer, and radar vehicles. Impressed by the artillery’s performance, Kuwait ordered additional 74 PLZ45 gun-howitzers in 2001. Hope so it satisfies your curious mind. 1. Can the Pakistani M109A2 be upgraded?? 2. How many M109A2 does PA has presently?? 3. If M109A2 can be upgraded, doesn't it make sense to upgrade them so that PA can double its Howitzers inventory?? PLZ 45 with laser guided munitions and heavy numbers will definately be a good choice.